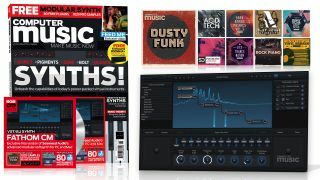 We’re only in the first quarter of 2019, and several cutting-edge virtual instruments have arrived, ranging from brand new wavetable weapons and modular environments to modern FM beasts and sequencer-powered tools. So to celebrate 2019’s new breed of powersynths and unlock their full potential, we’ll take you through sound design techniques specific to each. Watch one of the videos from the feature below, and get the rest only with CM268. This issue’s free cm Plugin is Fathom CM, a monster virtual instrument created by indie developers Seaweed Audio. This powerful modular polysynth is capable of virtual analogue, FM/AM, wavetable, additive and other synthesis types. 30 filter types are available, plus tons of effects and customisable modulators, too. Get the plugin in VST and AU formats for PC and Mac with Computer Music issue 268, and watch the video below to hear Fathom CM in action. Known for creating tough-edged DnB under his Spor alias, and more recently finding fame with his electro/EDM moniker Feed Me, Jon Gooch has been making premium-quality dance music since 2004. This February saw the long-awaited release of Jon’s album High Street Creeps, featuring the subject of this month’s Producer Masterclass: electro-house banger Satanic Panic, created in FL Studio. Check out the first half of the video below, and access the full video and interview feature with Computer Music issue 268.